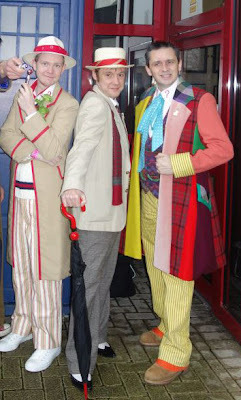 Hopefully you will have seen and enjoyed the complete Sixth Doctor costume I wore for Project Motor Mouth. But for me it was a tiny bit frustrating as it wasn’t actually 100% complete. 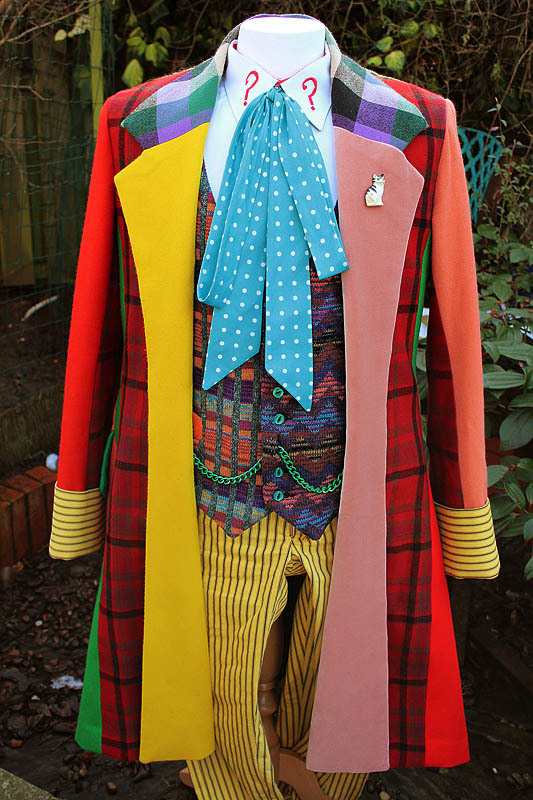 It didn’t notice too much, but I was lacking the green boots that finish off the garish look the Sixth Doctor wore. Annoyingly, the boots had already been made to measure for me, but due to my bout of flu and then the heavy snow just prior to the event, I wasn’t able to collect them as planned. But now I’m back to somewhere near full strength and the roads are a bit clearer, I’ve finally been able to get them from my boot makers. 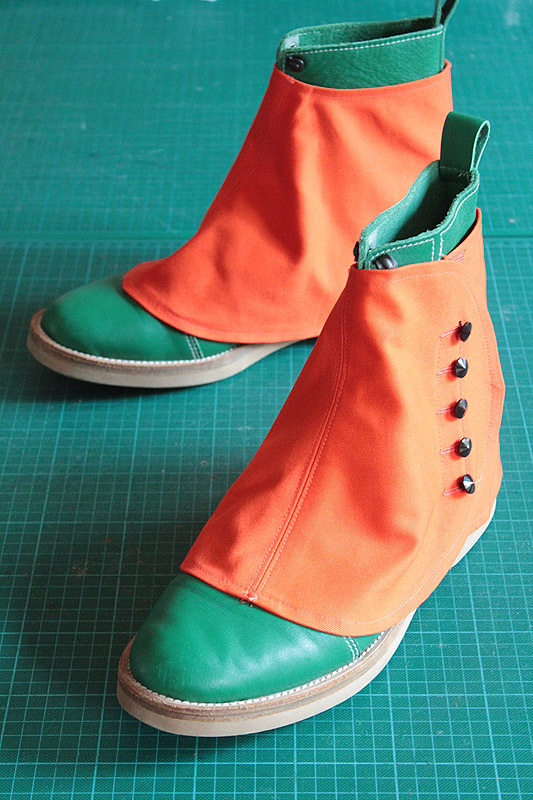 Back in 2009 I saw an original of screen worn boots at a viewing for the 16th June 2009 Bonhams Auction, and it’s these that mine have been directly modelled after. I regard them as the middle pair in a series of boots worn during the Colin Baker era. The following is a potted history as I see it and is by no means definitive, so please message me if you have anything to add. 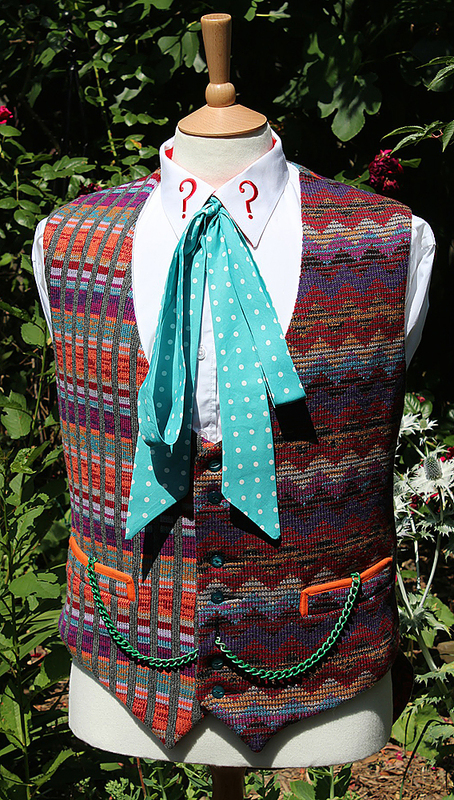 Here is what I have been able to find and work out about the Sixth Doctor’s footwear. 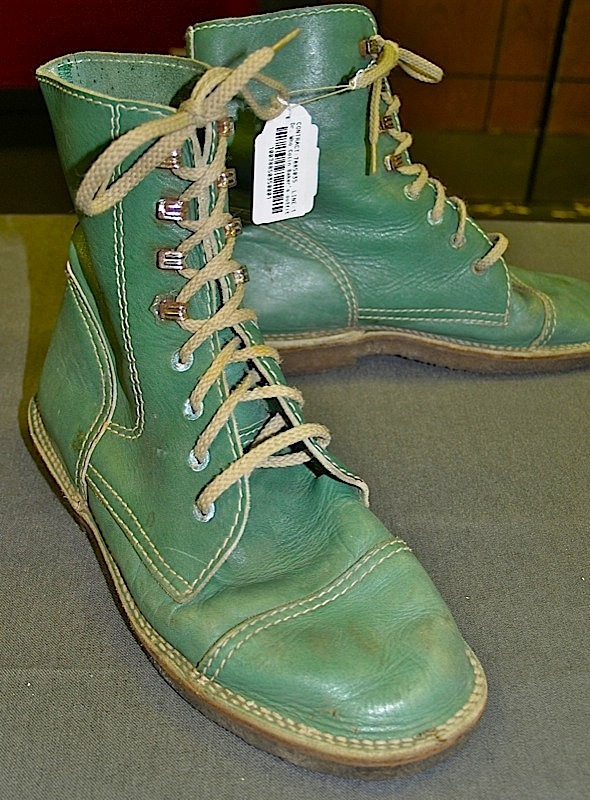 Originally he wore a pair of shop-sourced green ankle boots. I’m not totally sure of the brand name, but the things to look for are the combination of eyelets and hooks to lace them up; and a moulded Doc Marten-style rubber sole. The pair I viewed at Bonhams also had the eyelet and hook combination for the laces; no makers name was visible; the inside of the boots were unlined; and it had a plain leather sole. 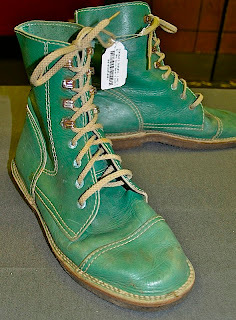 These I believe were a copy made when the original boots started to show signs of wear and replacements were unavailable. Hence the lack of manufacturers name and the use of a plain sole. A further pair I have seen has all eyelets with no hooks; a brown leather lining; and a plain leather white sole. I think these were made when the previous copies also started to show signs of their age. 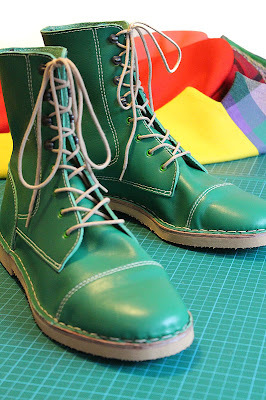 The use of all eyelets suggests they were made in haste and at minimal cost and the way they are made are uncannily like the work I have seen on Matt Smith’s boots. In fact I would not be surprised to find they were cut by the same company. So which pair to copy? Since it will be near impossible to make an authentic pair of the shop-sourced boots, I have gone for copying the first replacements. They are after all a hand-made copy and my versions would be made in the same way and would be of equal quality. But who should I get to make them? Well that’s a real no-brainer - since I work regularly with the makers of Matt Smith’s boots, they are the obvious choice since they did a similar thing by copying the All Saints boots for series five. Besides, it gives my boots some pedigree! AND HERE ARE THE COPIES THE BOOT MAKERS DID FOR ME! I gave the boot makers access to the third pair of boots as a guide, plus lots of reference pictures of the second pair to work from. 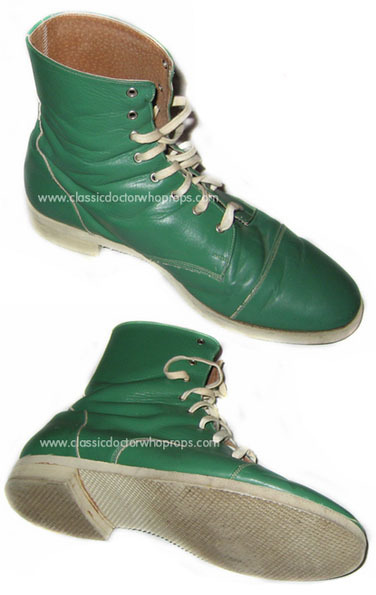 They painstakingly matched the green leather and followed every subtle line of white top stitch. 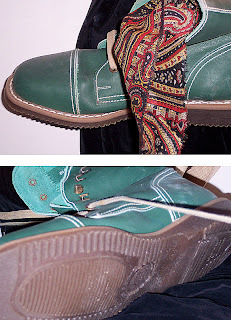 Suitable hooks were sourced to match as closely as possible those on the original boots. Being hand-made with a lot of decorative stitching, they weren’t cheap - but I’m very happy with the result and they now make my costume as complete and authentic as possible! I am now also offering the orange spats to go with the boots. 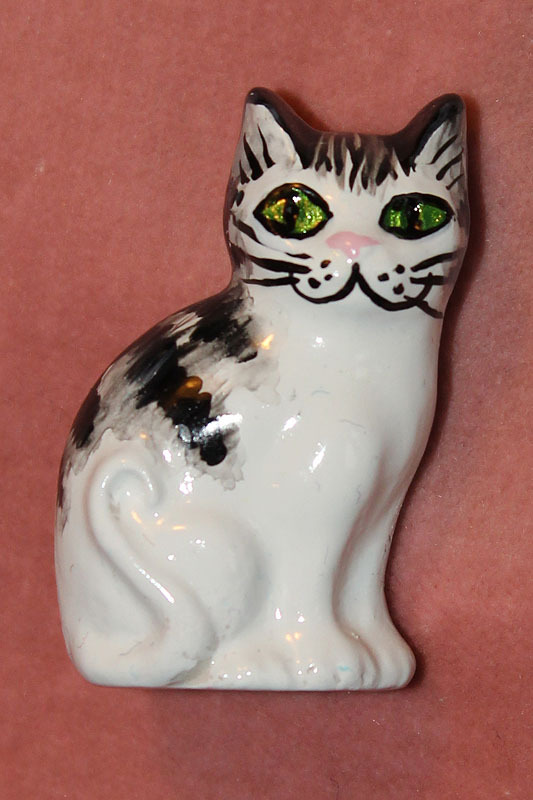 To think of these being professionally replicated, is very interesting! I look forward to seeing the result. If I had ridiculous amounts of money, I would (as you well know) without a doubt throw it at you and your fine craft. Sorry, you do understand that the final picture is my boots, copied form the originals?